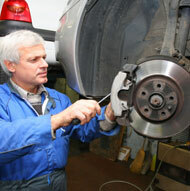 If you need brake repair in Sandy, then Master Muffler can get you in and out the door. Our team of expert technicians can handle any brake maintenance job and will let you know about what type of repairs you should anticipate in the future. From the diver’s perspective, the brakes work when the brake pedal is pushed. Which, is true when your brakes are in good condition. Have you ever noticed times that you had to push your pedal harder or further in to stop than normal? To understand why this happens its important to know a little bit about your brake system. If you are low on brake fluid, then the transfer of force from your foot to the brake disc isn’t efficient, so you have to press harder. If your brake pads are wearing down, then you might hear a high pitched scraping noise, or if the pad has worn completely through, a grinding sound. It is important to have your pads changed before this happens because it can cause many problems that are much more expensive than simply replacing your brake pads. 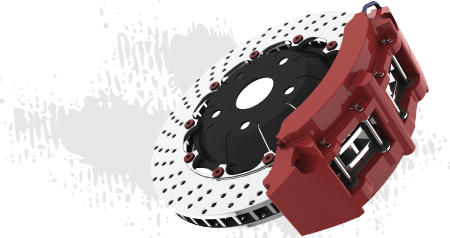 Brakes are one of the most important safety features on your vehicle and they are in constant use. Utah has extreme seasonal changes, so it is imperative to make sure your brakes are always in great shape. If you aren’t sure how to check your brakes, then bring them into us for a full inspection. Whether your brakes are making sounds or you’re just trying to get ready for the coming seasons: We’ll make sure your taken care of.